Color coordinated with my Princess phone! It seems as if every time a new school year rolls around, I put up a picture of me from Kindergarten or first grade. So today … I’m time traveling to high school! 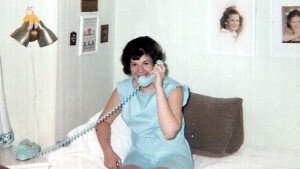 After my recent Esther Williams blog, I was in touch with my old friend Sandy, whom I wrote about. By the way, she’s still swimming and doing water aerobics, which doesn’t surprise me. She asked me if I remembered us being in the pool and hearing the school bus make its practice rounds – and how excited we’d be. (Almost as excited as when I got my own Princess phone!) I’d forgotten but it made me recall the great anticipation of a new school year. We didn’t know who our teacher would be until the last moment. Sandy and I would walk to Ben Franklin (a five-and-dime store, like Woolworth’s) and buy our school supplies. There were always new fall clothes – dresses and skirts only, of course. And there’s nothing sweeter than grabbing that last bit of summer fun. Hello, Sandy? Want to walk to the Crest to see that great new Gidget movie? I loved summer so much … but I was happy to go back to school and see all my friends. I hope I wasn’t the only one who loved school! Still, there was nothing like summer for reading. 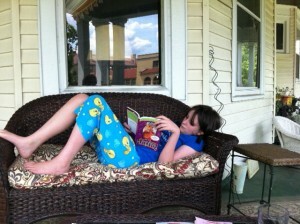 Ah, summer reading on the front porch – my great-niece Rita de Leeuw. Here’s my great-niece Rita reading Mysteries According to Humphrey in June. We were visiting her family in Glen Ridge, NJ for the day and she read the whole book while I was there. She found a few mistakes in the bound galleys, but they were corrected. (Future copy editor?) And she told me there’s a Mr. E. at her school, just like in the book. 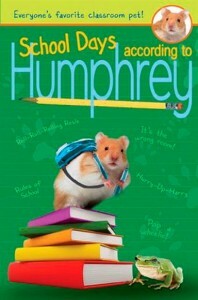 By the way, Rita contributed some excellent material for School Days According to Humphrey! 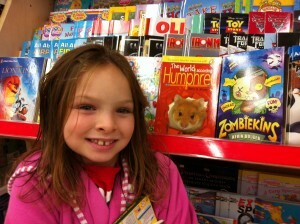 Great-niece Josie de Leeuw tracking down more Humphrey books! Meanwhile, her sister Josie was out scouting the Humphrey books at a local shop. I have a whole network of family members reporting on the stock at their local store. She also gave me a fun idea that I just might use one of these days. I’ve got to keep those girls working on Humphrey ideas! Anyway, ready or not … here comes the 2012-2013 school year. 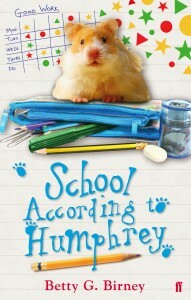 And I know one classroom hamster who’s unsqueakably happy to go back to school! This entry was posted in Friends and Family, Travel, Uncategorized. You can leave a response. Follow any responses to this entry through the RSS 2.0 feed.